Halloween might have passed, but it’s never too early to think about next year, especially the costume. Now, you might say it’s too soon to think about what you want to be for Halloween 2019, but soon you’ll be overwhelmed with how many choices and ideas you have. It can be a very long process to think of a costume, which is why it’s important to start thinking of one months before. You could be characters from a movie, or iconic figures. I’m still in the Halloween spirit, so here are three, cute and easy costume ideas you can be on Halloween. 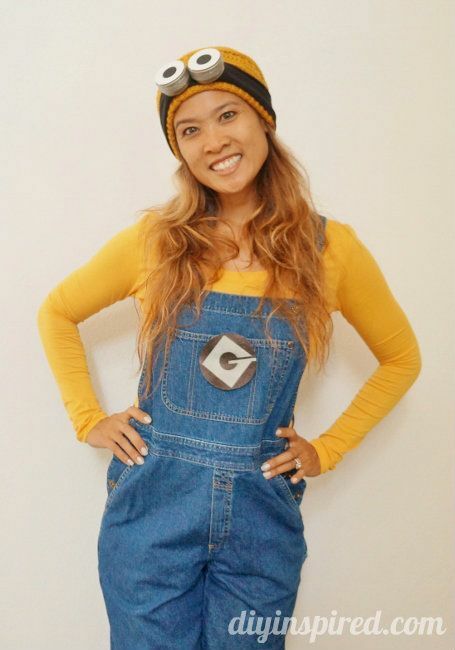 A great and easy costume is a minion. This costume makes a great group costume, or you could go by yourself. For this costume you will need a yellow shirt, denim short overalls, a yellow beanie, yellow knee-high socks, black gloves, and black tennis shoes. You could definitely put just those together as your costume, but if you want to go all out, you can add some cute accessories. To add the minion logo, you need to print out a picture of the minion logo onto iron-on transfer paper. Once you have done that, you can iron the logo onto a piece of felt, then stick the felt to your overalls. For the goggles, you could easily buy fake glasses with circle lenses, from Amazon. A costume you could do with another friend is Thing 1 and Thing 2. 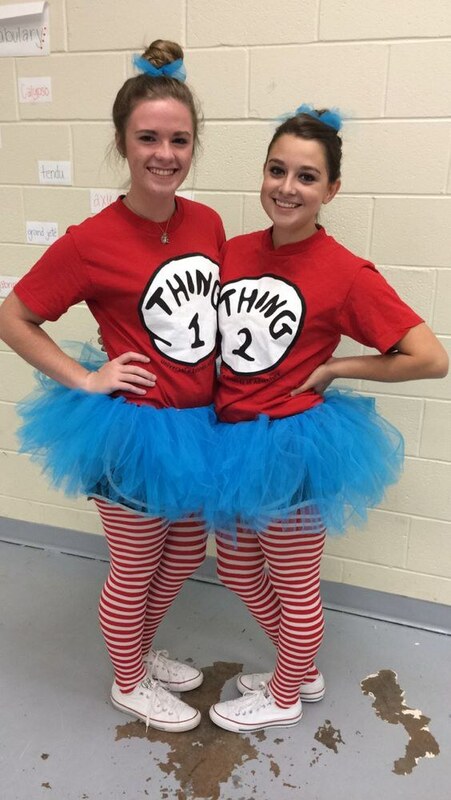 All you need are Thing 1 and Thing 2 shirts and blue tutus. The easiest place you can find these items is Amazon. This costume is really easy and inexpensive. If you put things off till the last minute, this is a great idea. 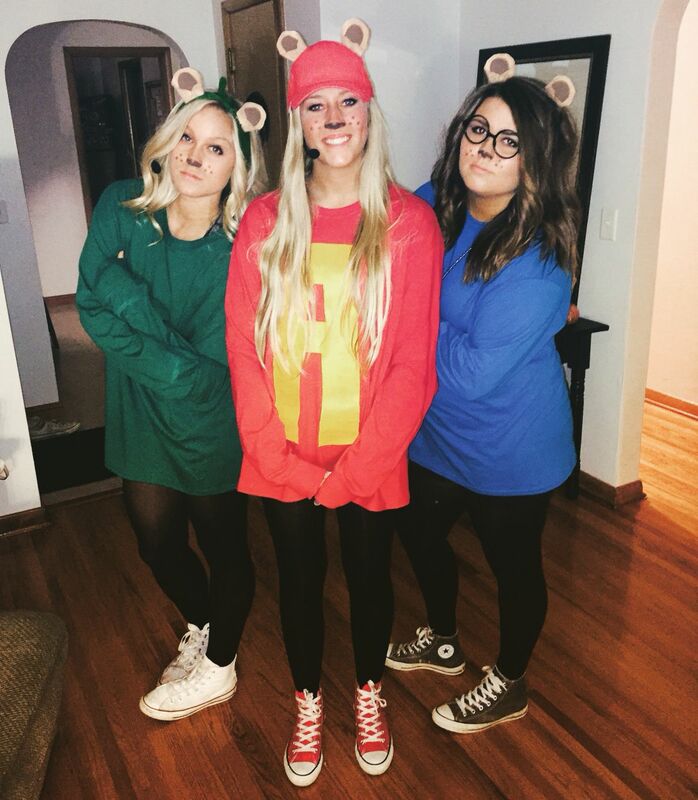 A very cute costume idea for a small group of friends is to be Simon, Alvin, and Theodore from Alvin And The Chipmunks. Most of the items you need for this costume are easily found in any clothing store, or might be in your closet already. For the person that is going to be Alvin, they will need a red t-shirt, red and white socks, a red baseball hat, black leggings, and white shoes. If you are going to be Simon, you will need a blue t-shirt paired with black leggings, blue and white socks, fake glasses with circle lenses, and white shoes. Lastly, for the person being Theodore, they will need a green shirt, black leggings, green and white socks,and white shoes. Then everyone should print out the name of the chipmunk they are portraying onto iron on paper and iron it onto the back of their shirt. Everyone should also put their hair into two space buns. These are three amazing, and super cute costume ideas you can be on Halloween. Get excited for next year already!